단순함, 백색, 그리고 유연하게 흘러가는 곡선은 발렌시아 아파트 인테리어를 이야기하는 단어 입니다. 70년대 지어진 16층 아파트의 일부 세대 리모델링 작업으로 기존 평면의 한계를 드라마틱하게 정리한 디자인 입니다. 최대한 간결하게 디자인 하되, 수려하게 흘러가는 곡선을 이용, 공간을 풍부하게 연출합니다.Located in one of the most iconic and prestigious building in Valencia, Spain, this recently renovated apartment by Valencia-based practice Balzar Arquitectos impresses with its abstract minimalism and sculptural fluidity.Built..
예술작가를 위한 작업실과 서고 인테리어 프로젝트 입니다. 천창을 통해 유입되는 자연채광으로 내부 공간의 조도를 확보하는 동시에, 부드러운 감성과 따뜻한 분위기를 만듭니다. The project concerns the interior design of an atelier which was used as by an artist, on whom we realized a new space of work as archives. Concept:These existing spaces intended in office/archives which are used by the artist reminded us first to use of the natural light coming from skylight. We crea..
스페인 발렌시아에 위치한 미니멀리스트 하우스. 집 앞에 위치한 작은 안뜰과 거실, 주방으로 연속된 거주공간은 작지만 실용적인 배치로 구성됩니다. 나무재질 마감재로 정제된 공간에서 오는 차가움을 순화시킵니다. PA House is a minimalist residence located in Valencia, Spain, designed by Olmos Estudio. The house is composed of a ground floor with patio, a first floor and attic room. On the ground floor, due to the small size of the house, service elements as kitchen, bathroom and stairs are ..
로프트 하우스는 뉴욕, 브로클린에 위치 합니다. 최소한의 디자인, 미니멀한 공간 연출은 맨하튼과 브로클린의 360도 전망을 위한 바탕으로 제공됩니다. 기존 노출콘크리트 마감과 우드, 타일이 정제된 공간을 마무리 합니다.Four Corners Loft is a minimalist space located in Brooklyn, New York, designed by Worrell Yeung. Situated in the landmark Clocktower Building in the Dumbo neighborhood of Brooklyn, the design of this loft capitalizes on the unique 360 degree views of Manhattan and Brooklyn. ..
스튜디오 ac가 설계한 미니멀 하우스는 내부로 수렴되는 공간설계를 통해 도심 속 거주자의 독립적인 사생활보호해주는 특징이 있다. 또한 로프트하우스의 공간적 특징인 오픈플랜을 확장, 아치형태의 복도로 공간을 연속시키는 연출도 재미있다. Candy Loft is a minimal interior located in Toronto, Canada, designed by StudioAC. The Candy Loft exists on the second story of a hard loft conversion on a busy street in Toronto’s downtown west end. StudioAC was asked by the client to design this loft space in a way..
North London House는 영국 런돈의 미니멀하우스이다. 초기 빅토리아풍 주택에서 변형된 복층주택으로 확장 개조하는 이번 프로젝트는 일광과 전망을 위해 일련의 공간을 연결시켰다. 새롭게 만들어진 부엌과 식사 공간, 서재는 노출된 오크 기둥과 보를 통해 비공식적으로 정의되어 자연채광이 지하층까지 깊숙히 침투할 수 있도록 하였다. North London House is a minimalist residence located in London, United Kingdom, designed by Architecture for London. This project extends a maisonette that had previously been converted from an early Victorian..
(Dis)order는 포르투갈에 있는 미니멀한 공간이다. 7.6 x 3.9 x 2.55m의 박스형태 공간 안에 서로 다른 세 개의 노란색 개체가 개별적으로 배치되어 있다. 상자의 한계와 노란 물체의 위치 안에서 사람의 움직임에 대한 인식은 필연적으로 뒤엉켜 얽혀 있지만 대상의 중요성은 주관적이고 명확하지 않다. 일종의 고전 건축요소의 추상화와 비교할 수도 있을 것이다. 현관과 중앙 거실과 침실은 파노라마 뷰와 함께 존재하지만 무엇이든 정의하는 시도가 단순하게 정당화되지는 않는다. 그 무엇도 가능한 공간으로서의 미니멀리즘, 그것이 이 공간을 설명한다. 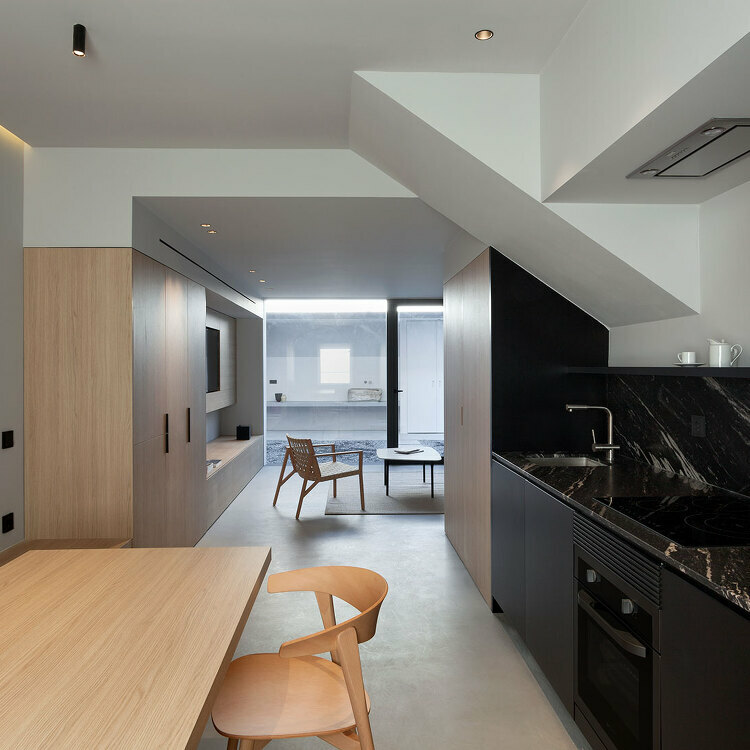 Architectural (Dis)order is a minimalist space located in Vilamoura, Portugal, designed..
일본 스튜디오 Puddle은 홍콩의 Kowloon 지역에 있는 페리 터미널 건물 내 작은 카페 아라비카(Arabica)를 설계하면서 기존의 구조와 일치하도록 흰색과 콘크리트 그리고 밝은 목재 표면을 사용했다. 이 카페는 스타 페리 터미널 빌딩 (Star Ferry Terminal Building)의 최상층에 위치하고 있는데 깔끔한 미니멀리스트 인테리어로 유명한 Puddle이 설계한 만큼 내부는 카운터를 제외하고는 바닥에 아무것도 거의 없는 심플한 정방형의 공간으로 탄생되었다. 브랜딩- 이 것이 이번 카페 디자인의 핵심 요소인데, 카페의 상징인 "%" 로고가 있는 커피잔 수백개가 인테리어 소품이고, 에스프레소 기계 앞엔 아라비카 문양이 있따. Japanese studio Puddle has designed..
19세기에 지어진 베를린 아파트는 90평방 미터 크기로, 지난 몇 년간 비어진 채로 방치되었지만 지금은 부부와 두 딸을 위한 현대적 거주지로 탈바꿈되었다. 이번 개조는, 가족에게 물건을 수납할 수 있는 공간을 더 많이 제공할 수 있도록 하는 데 중점을 두었다. 그래서 찬장과 서랍, 오픈 수납장 등이 아파트 전체 높이로 만들어 졌다. Sage-green storage closets and a swing seat are among the quirky details in this renovated 19th-century apartment in Berlin, designed by local studio Club Marginal Architekten. The Green Miracle is located in th..